Tour the world on the elegant Queen Elizabeth and discover luxury at sea with endless entertainment, sumptuous dining options and more all representing the classic Cunard experience. As with all of the Cunard cruise line, there is an emphasis put on luxury with a high standard of dining, entertainment and space for yourself. 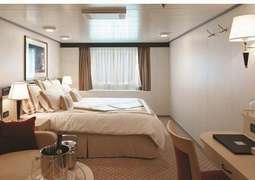 All of the cabins available are luxurious and spacious. The Queen Elizabeth offers world class entertainment options, with a repertoire of musicals and classical pieces in the 'Royal Court Theatre'. Grand balls are hosted in the 'Queens Room', where you get a chance to dress in your finest clothes and enjoy a night of dancing in the magnificent ballroom. The dining options on board range from the intimate 'Princess Grill Restaurant', with panoramic views while you dine, the 'Britannia Experience', an elegant setting of a beautiful hall in the art deco style to enjoy your 3 course meal. Afternoon tea is served in the 'Queens Room', with white gloved servers serving you while an orchestra provides accompaniment. In the evenings you can enjoy a drink in the 'Golden Lion Pub', a classic English Pub. The Queen Elizabeth is an example of the luxury and sophistication you expect with Cunard. 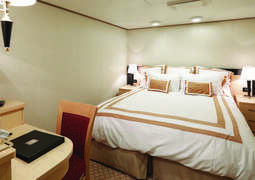 The staterooms onboard the Queen Elizabeth are the definition of style, luxury and comfort. 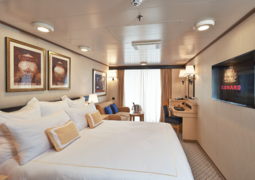 All cabins are spacious and contemporary with all the modern amenities you need to make sure your cruise experience is as comfortable as possible. Suites offer the ultimate in luxury with a butler service as well as access to exclusive dining options. The Queen Elizabeth offers a wide range of dining options and a varied selection of cuisines. There are a number of elegant dining options with waiter service including 'Queens Grill' restaurant and the 'Britannia Club' restaurant. The 'Verandah' is a particularly luxurious restaurant which offers the chance to sample some of the finest French cuisine. The 'Golden Lion Pub' is a traditional English pub serving food and drink in a classically unique English-style setting. 'The Lido' restaurant offers exotic cuisines such as dishes from Asia, Mexico and South America. On board the Queen Elizabeth there are also several bars and lounges for you to relax and enjoy a drink in. "Country House" Soirées and garden parties are a classic way to enjoy your evening stylishly with a glass of champagne and good company. Alternatively, head down to the 'Royal Arcade' shopping area and browse the many boutiques offering products from some of the world's best known brands. Spectacular shows are always sure to keep you entertained in the Royal Court Theatre. Take a dip in one of the onboard pools or kick back and relax in the hot tub before heading to the spa. Children of all ages are sure to be well looked after in "The Zone" and "The Play Zone" game areas. The Sports Deck offers the chance to work out whilst enjoying the magnificent ocean views. There are numerous open-air pools and jacuzzies, as well as a sports deck where you can play boules, tennis or croquet. You are also welcome to use the wide selection of fitness equipment in the modern gym. Learn to Jitterbug or Swing during one of the dance lessons offered as part of a wide and varied programme of activities found on board. Highly recommended is a visit to the exclusive Cunard 'Royal Spa'. Enjoy the peace and tranquillity of the spa while being completely pampered. A wide range of luxurious treatments such as aromatherapy massages are available.